If you ask a Spaniard about his favorite fish, he probably will tell you that It´s hake, by far. His delicate flesh and flavor make hake perfect for a million different ways to cook it. One of my favorites is the most classical way, Vasc Country style in a wine and parsley sauce with clams. Really easy to prepare. Finding hake in the Pacific NW is an impossible dream, but luckily the Chilean seabass make the treat. Two years ago I invited my friend and trainer Jessica and his new boyfriend Jaffer for dinner. They loved my clams and seabass dish so I promised to send her the recipe. But I never did it. This winter our friend Seth, a Texan Seattle newcomer who loves fish, wanted to learn more ways to enjoy the Pacific NW sea bounty so I remembered this old recipe and my old debt to Jessica and I finally sent it to both of them. Jessica cooked the dish for Jaffer and I would say, looking at the pic, that she did a great job! The happy ending of the story is that this weekend they got engaged! so I want to think that (altough I know It´s not true) that my Spanish dish played a role in this beautiful love story. Crush garlic, parsley and salt in the mortar and pestle. Fry the onion in olive oil at low temperature for about 10 minutes until the onion is traslucent. Add the water to the mix in the mortar. Pour it into the sauteed onions and cook for another 10 minutes over low heat with a glass of white wine. Incorporate the spiced seabass fillets covered in flour. Add the clams. Move slowly the pan to thicken the sauce while baking at medium low heat about 15 minutes. 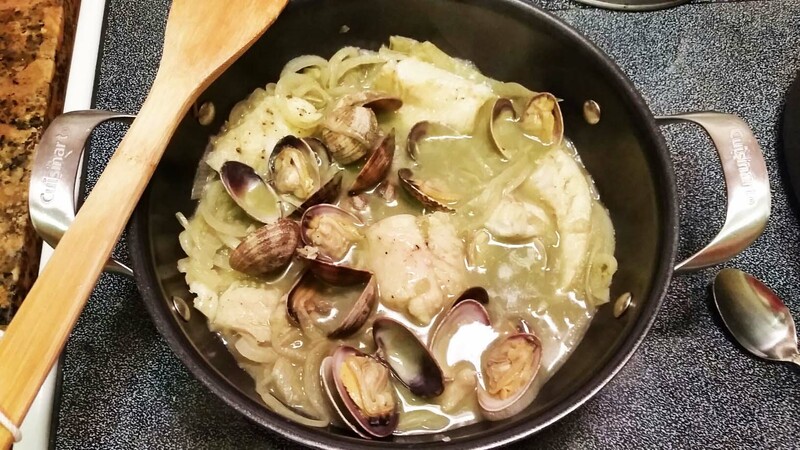 Posted on April 13, 2015, in Recipes, The yummy chronicles and tagged clam recipes, mortar and pestle, seabass, seabass recipes, Vasc country recipes. Bookmark the permalink. Leave a comment.